"Vancouver Whitecaps" redirects here. For other uses, see Vancouver Whitecaps (disambiguation). An ownership group in Vancouver were granted the seventeenth Major League Soccer franchise on March 18, 2009 by MLS Commissioner Don Garber. While no name was provided at the Vancouver announcement, over a year later the club confirmed it would keep the Whitecaps name. In preparation for its first MLS season, the Whitecaps brought in executive talent from around the world. On November 24, 2009, Paul Barber, former Tottenham Hotspur F.C. executive, was announced to join the club as CEO. Others joining him included former D.C. United head coach Tom Soehn as Director of Operations and Dutch national Richard Grootscholten as the Technical Director and head coach of the residency program. As the head coach of the USL and later USSF Division 2 Vancouver Whitecaps, former Iceland international Teitur Thordarson was confirmed as head coach on September 2, 2010 for the inaugural MLS season. He was subsequently relieved of his duties on May 30, 2011 after the Whitecaps won just one of their first twelve matches. Tom Soehn, the Whitecaps director of soccer operations, replaced Thordarson on an interim basis. The Whitecaps began play in the 2011 MLS season with their first match on March 19, 2011, against rival Canadians Toronto FC, which they won 4–2. The first goal in the Whitecaps' MLS era was scored by Eric Hassli. After their winning start the Whitecaps struggled, and failed to secure another victory in their next 11 MLS games, drawing six and losing five. In the aftermath of their 1–1 draw with the New York Red Bulls on May 30 head coach Teitur Thordarson was fired. Tom Soehn took over coaching duties for the remainder of the 2011 season, while Martin Rennie was announced as the new permanent head coach on August 9, taking over officially on November 2. On March 3, 2012, the Whitecaps won their first minor, pre-season cup at the 2012 Walt Disney World Pro Soccer Classic defeating Toronto FC 1–0 thanks to a goal by Camilo. The Whitecaps finished the regular season with 11 wins, 3 losses, and 10 ties positioning the club, 5th in the Western Conference and 11th on the league overall table. On October 21, 2012, the Whitecaps became the first Canadian team to earn a spot in the MLS playoffs. Vancouver were eliminated in the knockout round. In the 2013 season, Vancouver finished in 7th in the Western Conference, 13th in the league table with 13 wins, 12 losses, and 9 ties in the regular season. They were not able to qualify for the post season, in the playoffs as they had accomplished in the season prior. Two days after the end of the 2013 MLS regular season, Rennie's contract was not renewed sparking a search for the next head coach. In their off-season, the Whitecaps were in the midst of controversy with one of their then players, Camilo, who had played for the team since their inaugural campaign, after the Brazilian went on to join Liga MX club Querétaro. The Mexican club believed that he was no longer under contract, while the Whitecaps reported that he was still on a contract with Vancouver. The scandal was resolved with the Liga MX club paying a transfer fee from Vancouver to acquire the Brazilian forward. In October 2014, the Whitecaps qualified for the 2015–16 CONCACAF Champions League for the very first time as a result of becoming the highest ranked Canadian team in the 2014 MLS season and due to a reformatting of the Canadian Championship in the following season. A week later they qualified for the MLS playoffs for the second time, an achievement unmatched by any Canadian team. On June 8, 2010, it was officially announced the club would continue using the "Whitecaps" name, but with a redesigned logo. The name alludes to the geographic features surrounding the city: snow-capped mountains to the north and the Pacific Ocean's white-capped waves to the west. The official club colours include navy blue ("deep sea"), white, and light blue ("Whitecaps blue"). The "deep sea" blue represents the maritime landscape of the Vancouver area and the "Whitecaps blue" indicates the reflection of the North Shore Mountains in the Pacific Ocean. The lighter shade of blue also alludes to the primary colour of the original Whitecaps, winners of Soccer Bowl 1979. The silver outline pays homage to the team's championship victories since 1974. On June 10, 2010, the Whitecaps strip package was unveiled with Bell Canada serving as the inaugural jersey sponsor. The home shirt is white with horizontal, navy blue pinstripes; the stripes broaden slightly from bottom to top. The secondary shirt is deep blue with an embossed, interlocking diamond pattern which is also deep blue and is reflective in the light. On June 14, 2012, the Whitecaps unveiled a third kit. The third kit is predominantly "arbutus brown", with sky blue accents, which reflects the unique land full of deep roots and the high-reaching arms of the temperate rainforests of British Columbia. Home, away, and third kits. White sheets are used to artificially reduce the capacity of BC Place for Whitecaps FC matches. The Whitecaps plays its home matches at BC Place in Vancouver, which it shares with the BC Lions of the Canadian Football League. Vancouver has played at BC Place since the final month of the 2011 MLS season, having spent the majority of that year at Empire Field. BC Place is a 54,500-seat multi-purpose stadium designed for both Canadian football and soccer. The stadium opened in 1983, but underwent a complete two-phase revitalization project between 2009–2011. The stadium now features the largest cable-supported retractable roof in the world and polytan artificial turf, which is certified by FIFA with a 2-star rating. The Whitecaps reduce the stadium's capacity to 22,120 for matches by using white sails (known as the "secondary roof") to close off the upper bowl. Club ownership initially hoped to build Whitecaps Waterfront Stadium in Gastown in time for the 2016 season, but the club has committed to BC Place in light of stadium opposition. The club played most of its inaugural season at Empire Field, a temporary stadium built at the former site of Empire Stadium to house the Whitecaps and the BC Lions while BC Place was being renovated. Empire Field was a 27,500-seat multi-purpose stadium that featured FIFA 1-star rated FieldTurf. The team played its final match at Empire Field on September 24, 2011, a 3–1 loss to Seattle Sounders FC. The following week, the Whitecaps played their first match at BC Place, a 1–0 loss to Portland Timbers on October 2, 2011. The club does not have a permanent training facility, opting instead to use facilities around Greater Vancouver. However, the club partnered with the Government of British Columbia and the University of British Columbia (UBC) to build a $32.5 million National Soccer Development Centre on the UBC campus, which opened on September 22, 2017. Whitecaps supporters celebrating 4–2 victory over Toronto FC at Empire Field during inaugural MLS match. 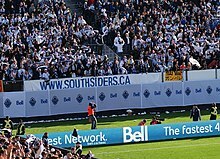 The largest Whitecaps supporters group is known as the Southsiders. The group began in 1999 when fans of the Vancouver 86ers began congregating in the pitch-level beer garden behind the goal at the south end of Swangard Stadium. The Southsiders' relationship with the team's ownership has not always been amicable. It has evolved since Vancouver received the MLS expansion team. Images of the Southsiders are featured prominently in Whitecaps' marketing campaigns. The group's board was invited to the invite-only launch of the kits and logo to be used in MLS. The expansion has also increased membership to over 1200. The president of the organization said that it had grown from about 40 paid members to 100 paid in July 2010. He also believes there is no reason why the Southsiders cannot outdo the Seattle Sounders' Emerald City Supporters. Southsider supporters are primarily located in the southeast corner (sections 249–254) of B.C. Place stadium. Two additional supporters groups are the Curva Collective and the Rain City Brigade. Curva Collective has grown to be the second-largest supporters group for the Whitecaps located in sections 203 and 204 or the southwest curva. The Rain City Brigade has a block of about 225 season tickets for their members in section 201 and marches from Library Square. Another group, "La Doce", formed in January 2011. Their original name in Spanish is "La 12", which can be translated into English as "The 12th" or "The 12th player". La 12 is formed by people from different nationalities that have a preference to support the Whitecaps in a Latin American, Southern European or Eastern European Style. The main feature of La 12 is its cheering style that features constant drumming and longer songs, resembling the way in which fans in South America or Southern or Eastern Europe like to support. La 12 fans were primarily seated in the southeast corner of Empire Field. The group has since folded after the 2011 season with many members joining Curva Collective. The team sold the first 5,000 $50 season ticket deposits 48 hours after they became available to the public. Remaining season tickets were made available to season ticket holders for the USSF 2 Whitecaps before becoming available to non-season ticket holders. The team managed to attract 15,500 season ticket holders in its first MLS season and 13,000 for the second. The official mascot for the Whitecaps is Spike, a Belted kingfisher, a bird common to the Vancouver area. The Vancouver Whitecaps have longstanding rivalries with both Seattle Sounders FC and the Portland Timbers. The rivalries predate MLS and have been an integral part of the soccer culture in the Pacific Northwest. Matches between these three teams are arguably the most passionate in all of MLS as each of these teams are well-supported by their respective cities. The Vancouver Whitecaps also have rivalries with Toronto FC and the Montreal Impact. Vancouver's first game in MLS was against Toronto in an attempt by the league to spur a rivalry between the two Canadian teams. Montreal was a rival in the second division. The three teams have played each other during Voyageurs Cup competitions. All Whitecaps matches are broadcast on television and radio. Through the 2013 season, Sportsnet Pacific and Sportsnet One nationally broadcast all "regional" Whitecaps games not televised by TSN or TSN2 as part of its national package of MLS games, broadcasting 24 games per season. Regional matches were called by Craig MacEwen, who does play-by-play, and former Vancouver 86ers goalkeeper Paul Dolan, who provides colour commentary. Dolan replaced former Vancouver Whitecaps midfielder Martin Nash, who provided colour commentary during the Whitecaps FC inaugural season. In January 2014, TSN (which is owned by Bell Media, a subsidiary of the Whitecaps' founding sponsor Bell Canada) announced that it would take over broadcast rights to these "regional" Whitecaps games beginning in the 2014 Major League Soccer season. In 2014, selected games aired on CTV and CTV Two's Vancouver-area affiliates due to scheduling conflicts. On radio, Whitecaps games are primarily broadcast on TSN Radio 1410 (also owned by Bell Media), with some matches being broadcast on its sister station, TSN Radio 1040. Until the end of the 2016 season, matches broadcast on radio has play-by-play duties shared between Peter Schaad and Scott Rintoul, and by former Vancouver Whitecaps midfielder David Norman, who provides colour commentary. Norman replaced Paul Dolan prior to the 2012 MLS season, after Dolan joined the Sportsnet broadcasting team. Vancouver Whitecaps FC is owned by a group of four investors; Greg Kerfoot, Steve Luczo, Jeff Mallett, and Steve Nash. The group has a collective net worth over $2 billion. Kerfoot has been the majority owner of the Whitecaps since 2002, when he saved the club from contraction after previous owner David Stadnyk left the club, selling it to United Soccer Leagues. He was previously the chairman and chief executive officer (CEO) of Crystal Decisions. Mallett, a former chief operating officer (COO) of Yahoo!, who was raised in Victoria, British Columbia, has a significant background in soccer. He played for the British Columbia under-16 provincial team and was on the University of Victoria Vikes squad that lost in the final of the 1982 CIS Men's Soccer Championship. He also spent one year with the San Francisco State University Gators men's soccer team before an injury left him unable to continue playing competitive soccer. After leaving Yahoo!, Mallett purchased a minority stakes in the San Francisco Giants of Major League Baseball and English soccer club Derby County F.C.. Having first met at a charity soccer event in 2005, Mallett partnered with Steve Nash—a two-time National Basketball Association (NBA) Most Valuable Player who was also raised in Victoria—to put together a bid for a minority share of English soccer club Tottenham Hotspur F.C. in 2008. After that transaction fell through, the duo contacted Kerfoot about a minority stake in the club. Nash is the older brother of former Whitecaps midfielder Martin Nash. The fourth partner, Steve Luczo, is the president, chairman, and CEO of Seagate Technology and a partner in Boston Basketball Partners L.L.C., a group who own the NBA Boston Celtics. Luczo met Kerfoot while the two were both employed by Seagate Technology, and Kerfoot contacted Luczo proposing he become part of the club's MLS bid. In 2009, the group paid a $35 million expansion fee to MLS for the right to join the league. For details on former players, see All-time Vancouver Whitecaps FC roster. Whitecaps FC 2 was the farm club of the Vancouver Whitecaps that was established on November 21, 2014. Whitecaps FC 2 began competing in the 2015 season, in the USL. On November 27, 2017, the Whitecaps dissolved their reserve side in favour of affiliating with 2018 expansion club Fresno FC. Vancouver has qualified for the CONCACAF Champions League twice, the first in the 2015–16 edition of the tournament. Bolded players are currently on the Whitecaps FC roster. ^ MLS franchise granted in 2009. Original team founded in 1974. ^ "Whitecaps FC legend Carl Valentine returns to the club". WhitecapsFC.com. MLS Digital. December 7, 2010. Retrieved December 27, 2010. ^ "Since 1974". WhitecapsFC.com. MLS Digital. Retrieved March 29, 2015. ^ "Whitecaps expand lower bowl capacity at B.C. Place to 22,120". March 4, 2016. ^ "MLS awards Vancouver team for 2011". March 18, 2009. Retrieved October 17, 2010. ^ "It's official: Whitecaps joining MLS in 2011". The Vancouver Sun. March 18, 2009. Archived from the original on March 22, 2009. ^ "Whitecaps to announce they will join MLS in 2011". The Vancouver Sun. March 17, 2009. Archived from the original on March 22, 2009. Retrieved March 18, 2009. ^ "Whitecaps to announce MLS franchise secured". Canwest News Service. March 17, 2009. Archived from the original on March 21, 2009. Retrieved March 18, 2009. ^ "– Technical Staff". Whitecapsfc.com. Retrieved November 4, 2011. ^ Vancouver Whitecaps FC (May 30, 2011). "Whitecaps FC announce technical staff changes". WhitecapsFC. Retrieved May 30, 2011. ^ "Whitecaps FC announce technical staff changes | Vancouver Whitecaps FC". Whitecapsfc.com. May 30, 2011. Retrieved November 4, 2011. ^ Martin MacMahon. "Vancouver's Rennie opens camp, names first assistant". MLSsoccer.com. Retrieved November 4, 2011. ^ "Whitecaps fire head coach Martin Rennie – CBC Sports – Soccer". Cbc.ca. October 29, 2013. Retrieved October 29, 2013. ^ "Mexican media say Camilo off to Liga MX's Queretaro, but Vancouver Whitecaps deny reports". Major League Soccer. Retrieved January 2, 2014. ^ "Vancouver Whitecaps' Carl Robinson surprised by Camilo's behavior, calls striker "unprofessional" | MLSsoccer.com". M.mlssoccer.com. October 2, 2016. Retrieved October 12, 2016. ^ "Vancouver Whitecaps, DC United join Seattle Sounders, LA Galaxy in 2015–16 CONCACAF Champions League". MLSsoccer.com. Retrieved October 19, 2014. ^ "Whitecaps FC reveal new crest, season ticket information". MLSSoccer.com. June 8, 2010. ^ "'Caps unveil logo and ticket information". Whitecaps.com. June 8, 2010. Retrieved February 9, 2011. ^ "Bell named Premier Founding Partner". Whitecaps.com. June 10, 2010. Retrieved February 9, 2011. ^ "'Caps enter MLS era with new kit". Whitecaps.com. June 10, 2010. Retrieved February 9, 2011. ^ "#Caps3rdKit". Whitecaps.com. June 14, 2012. Retrieved June 14, 2012. ^ a b Luba, Frank (February 8, 2011). "B.C. Place to see action by October". The Province. Retrieved October 7, 2012. ^ "WELCOME HOME, MAJOR LEAGUE SOCCER". BC Place stadium. Archived from the original on July 20, 2011. Retrieved November 29, 2010. And to create a more intimate and electric atmosphere, a flexible draping system is being considered that will reduce the seating capacity to 22,000. ^ a b "BC Place Reopens with Largest Cable-Supported Retractable Roof in the World". PCL Construction. October 18, 2011. Retrieved October 7, 2012. ^ Weber, Marc (September 24, 2011). "Empire falls, Caps hope BC Place provides kick-start". The Province. p. G2. ^ Cole, Cam (March 17, 2009). "Whitecaps set to begin new life as MLS squad". Postmedia News. ^ Marthaler, Jon (December 4, 2013). "MLS commissioner puts Minneapolis on short list for potential expansion". Star Tribune. Retrieved June 9, 2014. ^ a b Weber, Marc (December 22, 2009). "Empire Fields forever? No, just till 2011". The Province. p. A46. ^ Fudge, Simon (September 23, 2011). "Whitecaps FC end Empire Field era with disappointing defeat to arch-rivals Seattle Sounders FC". Vancouver Whitecaps FC. Retrieved October 7, 2012. ^ "Timbers spoil Whitecaps' first game at BC Place Stadium". The Sports Network. October 2, 2011. Retrieved October 7, 2012. ^ a b The Canadian Press (September 6, 2012). "Whitecaps, national teams receive new training facility". CBC Sports. Retrieved October 7, 2012. ^ "UBC officially opens National Soccer Development Centre". UBC News. September 22, 2017. Retrieved October 15, 2017. ^ a b Weber, Marc (July 21, 2010). "Tradition guides fans to the future". The Province. Archived from the original on July 29, 2010. Retrieved September 20, 2010. ^ "Whitecaps fans vital to their future". The Vancouver Sun. September 6, 2008. Retrieved September 20, 2010. ^ "Stiff test for Man U at Stamford Bridge". The Province. September 19, 2008. Retrieved September 20, 2010. ^ "Southsiders". whitecapsfc.com. Retrieved January 25, 2014. ^ Constantineau, Bruce (July 17, 2010). "That's the ticket – Caps' sales surge ahead of Timbers'". The Vancouver Sun. Archived from the original on August 23, 2010. Retrieved September 20, 2010. ^ Zac Ratcliffe. "Meet the three main supporters groups of Vancouver Whitecaps FC | Vancouver Whitecaps FC". Whitecapsfc.com. Retrieved October 20, 2012. ^ Yeoman, Matthew (April 26, 2012). "Meet The Curva Collective". Retrieved April 22, 2014. ^ "RAIN CITY BRIGADE – About". raincitybrigade.com. Retrieved March 29, 2015. ^ a b c Weber, Marc (March 16, 2011). "These Whitecaps fans hope to lend rhythm to MLS efforts". The Province. Vancouver. Retrieved March 24, 2011. ^ "First wave of Vancouver MLS ticket deposits gone" (Press release). Major League Soccer. March 23, 2009. Archived from the original on March 25, 2009. Retrieved March 25, 2009. ^ Weber, Marc (March 7, 2012). "Whitecaps season ticket holders return in droves despite last-place finish". Theprovince.com. Retrieved May 18, 2012. ^ "Spike #74". Vancouver Whitecaps FC. ^ Wahl, Grant (May 23, 2011). "A Pacific Passion Play: Big-time clubs left Portland, Seattle and Vancouver 30 years ago, but their fans never did. Now the teams are back in MLS, and their reborn rivalries are turning the region into a hotbed of the sport". SI.com. Sports Illustrated. Retrieved June 11, 2011. ^ Peterson, Anne M. (August 25, 2010). "Portland, Vancouver, Seattle in 3-way MLS rivalry". USA Today. Associated Press. Retrieved September 11, 2011. ^ Masters, Mark (March 19, 2011). "Unplugged: Don Garber on MLS's Canadian expansion". National Post. Retrieved September 11, 2011. ^ Atkinson, Hilary (May 8, 2010). "Whitecaps, Impact rivalry to reach major league levels in 2012". CTV News. Retrieved September 11, 2011. ^ "Whitecaps to Renew Rivalry with Toronto FC on Wednesday". The Sports Network(TSN). The Canadian Press. May 5, 2009. Retrieved September 11, 2011. ^ a b Vlessing, Etan (March 4, 2011). "Rogers SportsNet Grabs TV Soccer Package". The Hollywood Reporter. Retrieved October 7, 2012. ^ Timko, Brandon (February 10, 2012). "Paul Dolan named analyst for Sportsnet's Whitecaps FC telecasts". Vancouver Whitecaps FC. Retrieved October 7, 2012. ^ Weber, Marc (March 21, 2011). "Caps CEO flying high". The Province. p. A36. ^ Powell, Chris (February 15, 2011). "TSN signs six-year broadcast deal with MLS". Marketing. Retrieved October 7, 2012. ^ "Wileman and deVos join MLS on TSN broadcast team". TSN.ca. March 10, 2011. Retrieved October 7, 2012. ^ "Every Game, All Season Long: MLS ON TSN Kicks Off its Complete Coverage of Vancouver Whitecaps FC This Saturday". Bell Media. Retrieved April 5, 2014. ^ "TSN to broadcast all Whitecaps FC games beginning in 2014". TSN.ca. Bell Media. Retrieved January 21, 2014. ^ a b Constantineau, Bruce (February 11, 2011). "Homestand sweet homestand". The Vancouver Sun. p. F2. ^ Weber, Marc (March 1, 2011). "We must be tops, says TEAM guy". The Province. p. A40. ^ a b Timko, Brandon (February 10, 2012). "David Norman named TSN Radio 1410 colour commentator for Whitecaps FC matches". Vancouver Whitecaps FC. Retrieved October 7, 2012. ^ March 1, 20164:00PM PST (March 1, 2016). "TSN Radio 1040 Vancouver to be home to Vancouver Whitecaps FC | Vancouver Whitecaps FC". Whitecapsfc.com. Retrieved December 24, 2016. ^ "Layoffs and downsizing hits Vancouver sports media scene". Retrieved February 2, 2017. ^ a b c d e f g h i Grange, Michael (February 24, 2011). "Has soccer's time come in Canada?". The Globe and Mail. Retrieved October 7, 2012. ^ a b Weber, Marc (March 18, 2011). "Vision becomes reality for Kerfoot". The Province. Retrieved October 7, 2012. ^ a b Steedman, Scott (April 1, 2011). "How the Vancouver Whitecaps Hit the Major Leagues". Vancouver Magazine. Retrieved October 7, 2012. ^ "Premier's Technology Council Members Biographies". Province of British Columbia. Retrieved October 7, 2012. ^ Weber, Marc (October 24, 2008). "Patience pays for Luczo, the Caps newest investor". The Province. Retrieved October 7, 2012. ^ a b "Roster -(Men's First Team)". Whitecaps.com. Retrieved February 10, 2018. ^ "Technical Staff | Vancouver Whitecaps FC". WhitecapsFC.com. MLS Digital. January 8, 2014. Retrieved February 25, 2014. ^ "Executive Team". WhitecapsFC.com. MLS Digital. May 4, 2012. Retrieved July 6, 2015. ^ Martin MacMahon (August 9, 2011). "Whitecaps name Rennie as head coach starting in 2012". MLSsoccer.com. Retrieved November 4, 2011. ^ "Whitecaps FC launch USL PRO team, provide update on National Soccer Development Centre at UBC". Vancouver Whitecaps FC. November 21, 2014. Retrieved November 21, 2014. ^ "Vancouver Whitecaps FC announce new USL affiliation with Fresno FC". Whitecaps FC. November 17, 2017. Retrieved November 17, 2017. ^ "Tigres down Whitecaps to secure spot in CONCACAF final". Retrieved April 6, 2017. ^ Farhan Devji (October 9, 2013). "Manneh hat-trick propels Vancouver Whitecaps FC to historic 4–1 victory over Seattle Sounders FC". Vancouver Whitecaps FC. Retrieved May 27, 2018. ^ Farhan Devji (October 27, 2013). "Camilo hat-trick carries Vancouver Whitecaps FC to 3–0 win over Colorado Rapids in 2013 season finale". Vancouver Whitecaps FC. Retrieved May 27, 2018. ^ Emily Olsen (May 26, 2018). "Vancouver Whitecaps 3, New England Revolution 3 | 2018 MLS Match Recap". MLSsoccer.com MatchCenter. Retrieved May 27, 2018.